The quiet rooms, the silent ladies, the magic light of the world of Vermeer. It is the beginning of a new world in Western painting. No more crucifixions. No altarpieces. No Madonnas. After five hundred years, suddenly the Madonna and Child disappear from painting in Holland and a new subject appears: the common man and the common woman. Maids. Cleaning women. Geographers. Astronomers. It is a new day. Birth of Vermeer's father, Reyner Jansz. Grandfather Jan, a tailor from Flanders. Now recently had moved to Delft. Marriage of Reyner Jansz, then a weaver, to Digna Baltens, in Amsterdam. In Delft: Birth of the couple's first child, Geertruijt. Reyner Jansz joins the Guild of Saint Luke as "Master Art Dealer." Vermeer will later join the same guild also with the occupation as art dealer and painter. (Interesting that two of three greatest Dutch painters of all time were both art dealers as well as painters). Birth of "Johannis." Baptism in the New Church (Niewe Kerk) in Delft. Reyner buys the house and adjoining inn on the central market square of Delft called "Mechelin," a two story substantial structure at the center of Delft for 2700 florins (value of florin and guilder very close ... both were very solid currency). Death of Vermeer's father: Reyner. April fifth, Vermeer registers his intention to marry Catharina Bolnes. Two witnesses state in the documents that on the previous evening, Vermeer's future mother-in-law, Maria Thins, has refused to sign a formal consent to the marriage but that she "would suffer the marriage banns to be published and would tolerate it." Thus we can assume that Maria lacked faith in her future son-in-law's prospects. April twentieth, Johannes Vermeer marries Catharina Bolnes. 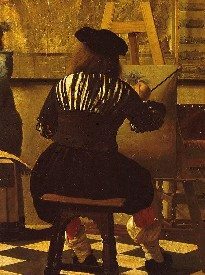 December twenty-ninth, Vermeer is registered in the Guild of Saint Luke as a master painter. We know nothing about his years of study: who his teacher was, who his fellow students were. Vermeer signs and dates a painting: Saint Praxedis. Maria Thins writes her first will and leaves three hundred guilders to Vermeer and his wife Catharina and her jewels to her namesake Maria, Vermeer's first (of 11) child. Obviously now in 1657 mother-in-law Maria is in good standing with her daughter and son-in-law, a fact that is demonstrated repeatedly in her generosity to them, including having them move into her home at one point. Vermeer borrows two hundred guilders from a wealthy Delft burgher. So in 1657, the painting business is not able to pay his bills for his growing family. A child of the Vermeers is buried in the Old Church (Oude Kerk) and documents indicate that the Vermeers were probably now living with Catharina's mother in the Roman Catholic part of the city called Papist's Corner. Vermeer is elected head of the Saint Luke's Guild for a term of two years indicating that he is a repected member of the painting world of Delft at this time. French diplomat Balthasar de Monconys (1611-1655) visits Delft to see Vermeer's paintings. Vermeer has none in his studio (because they were all loaned out to creditors or because he had sold them all?) and the diplomat is told that he must go see two of the paintings in the shop of a baker who had the paintings as surety on a loan. The diplomat goes to see the paintings and declares that they are over priced. Birth of first son for Vermeer and wife Catharina. In a patriotic poem about Delft, Vermeer is listed as a worthy successor to the deceased painter Carel Fabritius. (One of our only documented statements about Vermeer's reputation during his lifetime). Death of Vermeer's mother and his sister and Vermeer inherits 148 guilders and the family house-inn known as "Mechelin." He is also elected again as headman of the Guild of Saint Luke. Vermeer and the Delft painter Johannes Jordaens are asked to come to The Hague to examine the worth of twelve paintings that are reputed to be outstanding works of Italian art. Vermeer and his companion testify that the works are "great pieces of rubbish and bad paintings." This is fascinating since it establishes that is some way Vermeer had been able to become an expert in Italian painting. How? Had he been to Italy or had he only seen the many examples of Italian art in the Netherlands. Either way it clarifies for us what he knew about art. Vermeer borrows 1,000 guilders in Amsterdam. This is a large sum and suggests that even now at this advanced stage of his career he is unable to sell enough paintings to pay all the bills. Johannes Vermeer dies on December sixteenth at the age of forty-three and is buried in the Old Church of Delft. He is survived by his wife Catharina and eleven children. Catharina sells two of her husband's paintings to the baker Hendrick van Buyten to settle a debt of 617 guilders thus giving us some idea of what a painting of Vermeer might be worth in 1676. But at the same time a Haarlem art dealer acting for one of Vermeer's creditors buys twenty-six paintings for a value of five hundred guilders and transfers the collection to Haarlem. In this same year a written inventory of movable goods in Vermeer's estate is produced and thus helps art historians to locate various items in his paintings. And the authorities in Delft appoint Anthony van Leeuwenhoek, an early developer of the microscope, as the executor of the Vermeer estate. The twenty-six paintings taken to Haarlem are brought back for a public sale to be arranged by Leeuwenhoek. In Guildhall of Saint Luke, Delft: A sale of paintings in the Vermeer estate. Vermeer's mother-in-law Maria Thins dies. (Feb) Giordano Bruno burned as heretic: Campo dei Fiori-Rome. Shakespeare's Hamlet. Tycho Brahe and Johanes Kepler working together in Prague. Earl of Essex leads revolt against Eliz; is tried and executed. Queen Eliz delivers her "Golden Speech" surveying 43 year reign. Jesuit missionary Matteo Ricci admitted to Peking. Death of Queen Elizabeth of England. Cousin James of Scotland succeeds as James I.
Cervantes' Don Quixote Part I, published. Shakespeare's King Lear and Macbeth. Sir Francis Bacon, The Advancement of Learning. In London, Guy Fawkes and the Gunpowder Plot. Foundation of colony of Jamestown, Virginia. first English settlement in America. Birth of John Milton. Dutchman John Lippershey invents telescope. First "checks" (Cash letters) in use in Netherlands. Dutch East India Co ships first tea to Europe from China. Galileo, The Starry Messenger, published in Venice. Assassination of King Henry IV of France. succeeded by his son Louis XIII at age 9. mother Marie de' Medici as Regent.Death of Caravaggio. Henry Hudson sails into Hudson's Straits and discovers Hudson's Bay. John Donne: Anatomy of the World. Dutch on Manhattan Island. Begin building very tall buildings. Sir Walter Raleigh writes The History of the World. Death of El Greco. Death of Shakespeare. Death of Cervantes. Thirty Years War. all Europe drawn in (Prot vs Cath). Wm Harvey announces discovery of circulation of blood. (London). Pilgrims leave Plymouth, England in Mayflower, seek religious liberty (Puritans). Philip IV, King of Spain (to 1665), Velasquez paints the king. Protestant rebellion in France. War between Holland and Spain. Weekeley Newes issued in London for first time. Beginning of modern newspapers, London ahead of all cities. Publish the First Folio edition of Mr William Shakespeare's "Comedies, Histories and Tragedies Published According to the True Originall Copies." Death of King James I. succeeded by son Charles I.
John Winthrop (1587-1649) sails with Plymouth Company expedition, April arrives Mass. with 1000 settlers, founds Boston in Sept, becomes first governor of the state, 16,000 more settlers follow. (Feb.21) Galileo: Dialogue on Two Chief World Systems (pub in Flo). First coffee shop opens in London(Newspapers and coffee houses).Birth of John Locke. Rembrandt: Anatomy Lesson of Dr Tulp(Science in art). (Jun) Galileo in before Inquisition: abjures the Dialogue in Rome. Foundation of Harvard. Tea appears in Paris for first time. Nicolas Poussin paints "Et in Arcadia Ego" appearance of central myth of 18th century Romanticism, run off to country, be a shepherd which all French aristocracy will soon enjoy: playing at Arcadia in the woods near their castles. Short Parliament & Long Parliament(to 1653).Begin of war between King of England and the Parliament. Begin hostilities of the English Civil War. All theaters closed in England: by order of the Puritans now in control of Parliament. (till 1660). Rembrandt's The Night Watch.Death of Galileo. King Louis XIV becomes King of France (to 1715) the most powerful monarch of the 17th century. Moliere founds the Illustre Theatre in Paris, later Comedie Francaise. Descartes: Principia philosophicae ("Cogito ergo sum"). John Milton: Areopagitica argues for the freedom of the press, radical idea and part of the growing democratic spirit of both England and the new colonies. King Charles of England captured, taken prisoner. End of 30 Yrs War, pop of Germany down to 8 mil from 17 mil(1618). (Jan 19)Trial of King of England before court of Parliament. (Jan. 30)Execution of the King of England by Parliament. Parliament invites Charles II: Come back into England. First issue of London Gazette: one of first newspapers. Death of King Charles II of England, succeeded by James II. Expel James II, invite in Protestant William and Mary from Holland. Parliament confirms "abdication" of James, accession of Wm & Mary. Proclamation of a Declaration of Rights in England (freedom of speech, press). John Locke: Essay Concerning Human Understanding. well-reviewed in the April 16, 2001 New Yorker. and Vermeer, of whom so much is unknown, is a topic of perpetual interest.